I had another week of doing nothing before going back to work after a month’s leave. When the invitation came, I jumped at the chance, wanting to make the most out of my leave before I plunge back into the grind. Besides, how can I say no to a weekend at Misibis Bay? Located in Cagraray Island in Albay, the resort is far enough from the city to make you feel you’re away from everything, but not too far to make traveling there uncomfortable. The drive to the resort from Legazpi takes about 1 hour of driving through (good) roads that wind along the mountains and a short ride on a barge to cross to the island. A warm welcome greeted us upon arrival at the resort. A lei was placed on our necks, a cold towel placed in one hand and a refreshing drink in the other, then we were led to the reception to check in. 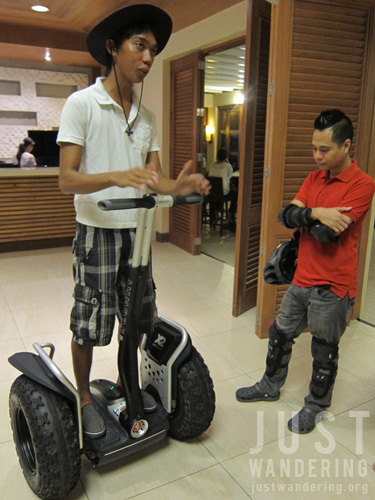 While waiting for our room assignments to get sorted, a hotel staff sped past the reception building on a Segway. The resort offers various activities to guests, including Segway tours around the resort, ATV tours that passes through the ecopark, windsurfing, jet-ski and Hobie Cat sailing. Parents traveling with kids will surely appreciate the kid’s indoor play area and the outdoor playground. There is also the ubiquitous spa and gym, as well as an infinity, lagoon and children’s pool. All our meals were had at the Spice Market, where F&B manager Rex Cortez plied us with stories and drinks. For a non-drinker, he sure can whip up some pretty good cocktails. Be sure to try out his Lemon Drop, frozen margarita and coconut lychee martini. If alcoholic drinks aren’t for you, try the Cagraray Sunrise, a refreshing drink with cucumber and carrots. The buffet selection wasn’t as extensive, but there is a good enough selection of meat, fish and vegetable dishes, and of course, Bicolano favorites like laing and Bicol Express. There is also a good variation of the buffet offerings so you don’t see a repeat of any meal during lunch or dinner. Dessert lovers will surely be delighted with the array of sweets offered. We stayed at two different rooms during our stay. On our first night, we had one of the villa rooms, One-bedroom deluxe by the poolside. Upon entrance, we were greeted by a small table with a plate of fresh fruits and cookies. Further in was a huge couch that transforms into extra beds, and a terrace looking out towards the lagoon pool. The bedroom was huge, and instead of having the desk pushed up against a wall, it’s located right at the headboard so you’d have an unobstructed view when working or laying on the bed. The bathroom was huge, which is a big plus if you’re sharing the room with four people. It has two sinks so you can brush your teeth while your roommate puts on make up. The toilet has its own enclosed space, and the tub was bigger than the average. Best of all, the shower is separate. On our second stay at Misibis Bay, we were assigned to the Garden View rooms, which were opened just last June. Decorated with colorful accent colors, these rooms have a completely different vibe from the villa rooms, but still maintains the same level of comfort and service. 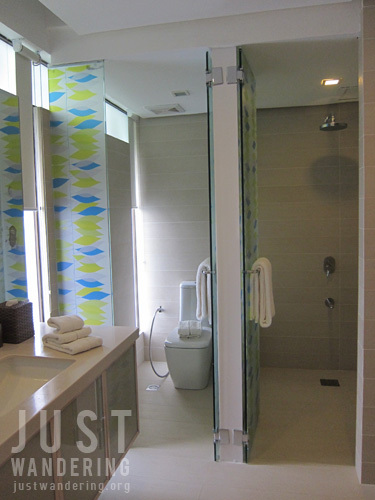 Though the bathroom is much smaller, it is still roomy enough for two people. Misibis Bay is perfect for those who want to take it easy and relax. True, it’s rather pricey, but it’s a pretty good splurge. The resort’s 3 days, 2 nights package is all inclusive of all meals, non-motorized activities and certain motorized activities. The only thing you have to worry about is how to divide your time between lounging in the pool and doing all those activities. 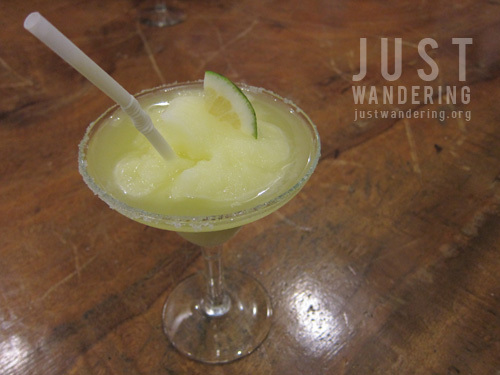 More pictures on the Just Wandering Facebook Page. Wow!! I love the beauty of the rooms of this villa. It seems a luxury Villa. the resort is looks luxurious, but the price is a little high. what do you think of the price? 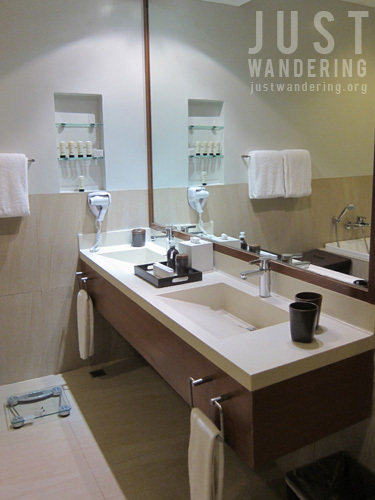 Love the accent color on the garden view rooms and those bathrooms are divine! Who is that hot guy in red??? 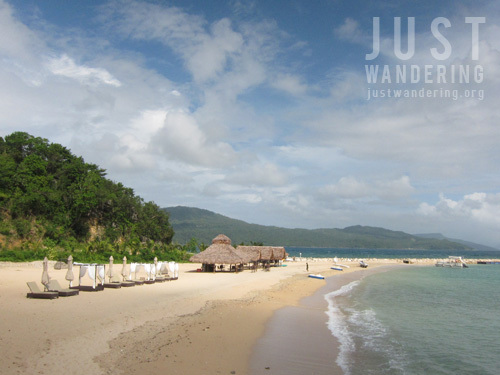 Misibis Bay is just one of Albay’s pride. 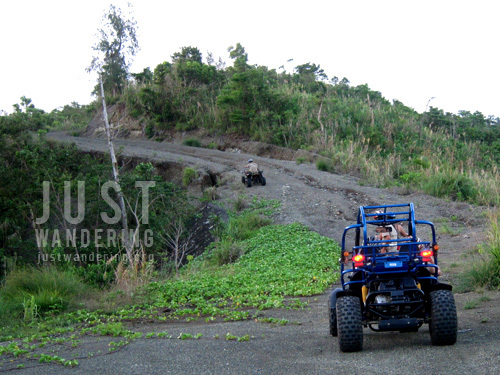 Tourists can also go to other places like Cagsawa ruins, Mayon volcano and Lignon Hill. 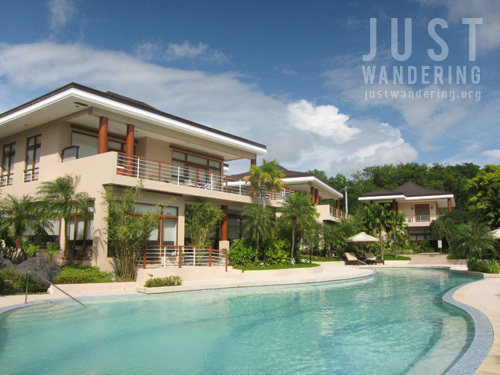 Hot springs, caves and other wonderful man-made and nature made tourist destinations can also be found in Albay.